Only 35% of weekday FT readers take the Saturday edition, according to Caroline Daniel, who was appointed editor of FT Weekend in May. Daniel wants to increase sales by encouraging more of the paper's star writers to appear in the Saturday edition. She has overseen the launch of a new-look version of the FT magazine, which debuts on Saturday, and will become a second home for many of them – including Gillian Tett and Lucy Kellaway. 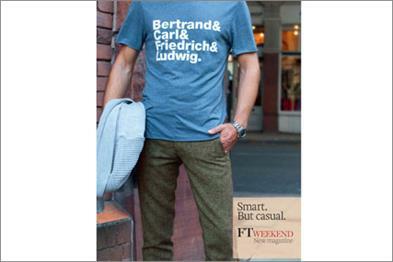 La promoción del nuevo FT Weekend cuenta con un presupuesto de 1 millón de libras y llevará por eslogan "Smart but Casual". Por Alfonso Vara Miguel a las 7:02 a. m.